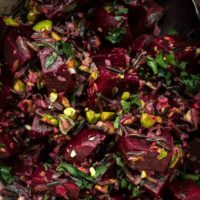 Beet Wild Rice Salad with Pistachios | Naturally. There are times I go into developing recipes where I expect failure. I expect that certain flavors won’t work well together or textures won’t be appealing. The reason I still try? This wild rice salad is a perfect example. The salad has some strong flavors that in theory, I thought would work well together. The resulting salad was better than even I expected. The earthiness from the beets and wild rice are brought together nicely with the pistachios. However, it’s really the lemon and salt that meld everything. In terms of the wild rice, I have soft spot for this grain. It’s one of the few items that can be easily traced back in the history of the United States. It’s a upper midwestern staple that is also produced in California. Just be prepared, it’s not like white/brown rice. The flavor is is more pronounced which is why I love it in this salad. An earthy and filling grain salad using wild rice, beets, and pistachios all brought together with my favorite lemon vinaigrette. Rinse the wild rice thoroughly. Place in a pot along with 2 cups water. Bring to a boil, reduce to a simmer, cover, and cook until the rice is tender; 50 minutes or so until the majority of the water has been absorbed. Remove from heat and allow to rest for 5 minutes. Add salt and fluff the rice. While the rice is cooking, trim the ends from from the beets. I like to use beets that are a little larger than a golf ball. Place in a pot of boiling water along with the lemon and cook until tender, 30 to 50 minutes (time will depend on the size of the beets). The beets should be tender enough to pierce with a knife but not fall apart. Drain and let beets cool enough to touch. Peel the beets and cut into quarters. Combine the hot rice with beets, pistachios, and parsley. Pour the dressing over the salad and toss until everything is well combined. Taste and add more dressing and/or salt as desired. Tips & Tricks: I found the balance of salt and lemon juice to be the make or break of this salad. I like to start out light on both and add a pinch and drizzle as needed. This salad is also really nice with roasted beets. 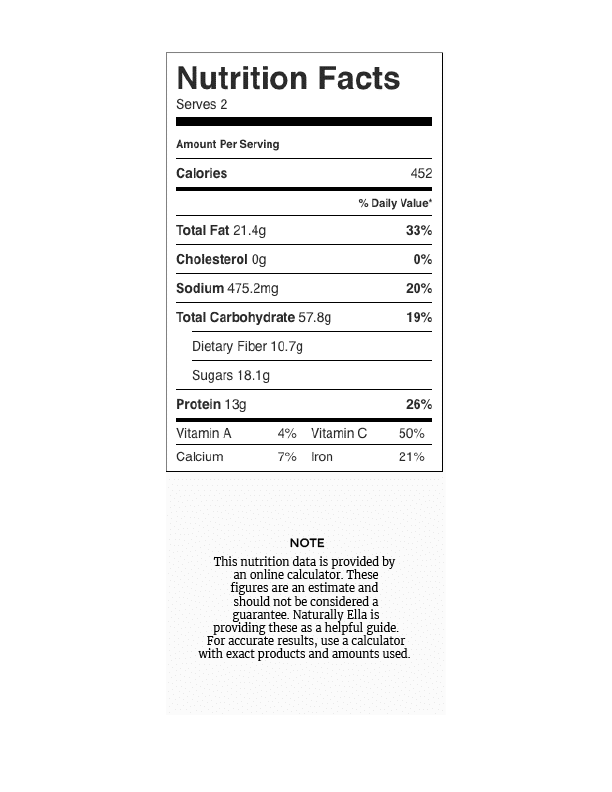 Grains: Wild rice not your favorite? The flavor of the overall salad will be different but you could use brown rice, sorghum, or a quicker cooking grain like freekeh. Really any grain would work but stick with one that still have a bit of texture after cooking. Greens: Make a more traditional salad by tossing the beets/wild rice with spinach or kale. Cheese: I really love this salad as is but a sprinkle of feta would be nice. You could also fry halloumi to chop and add to the salad. During the fall and winter months, I always have beets stowed away in my crisper. The greens make for a nice addition to stir-frys and sautés. Also, the beet roots keep for a couple of weeks and can be used in many different ways (the cupcakes are a particular favorite of mine). Look for all the different varieties as they can be used interchangeably, each adding a lovely pop of color to meals. Yum! 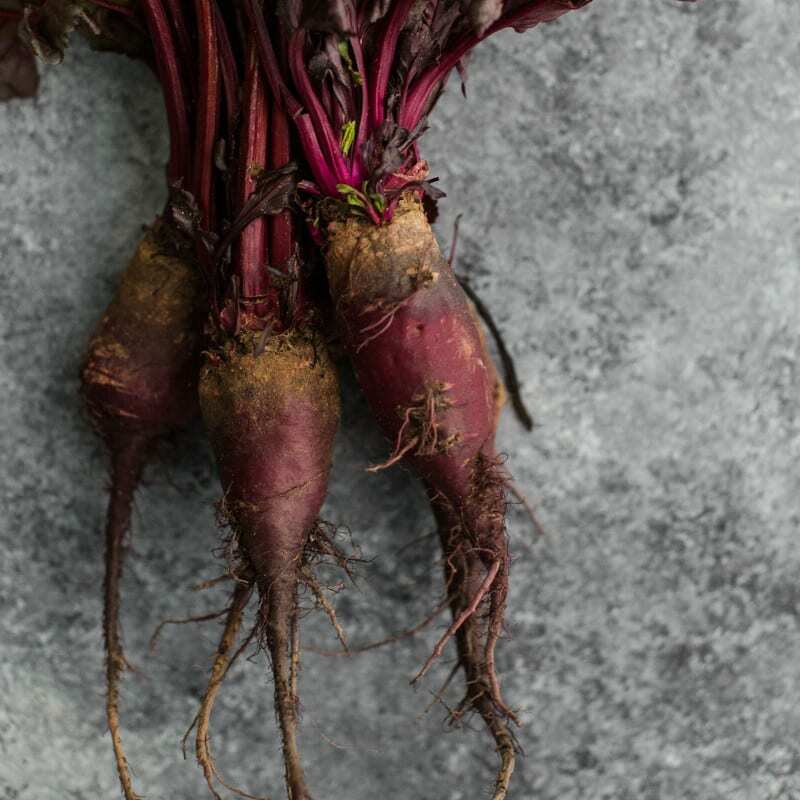 I actually have some beets and trying to figure out what to do with them This recipe could have not come at a better time! Thanks for sharing. I love everything about this beet salad! It looks delicious and easy to make. Win-win!! Can’t wait to make it!! This is a fabulous recipe, no doubt about it. (I’d attach a photo from tonight’s dinner if the site allowed me to.) 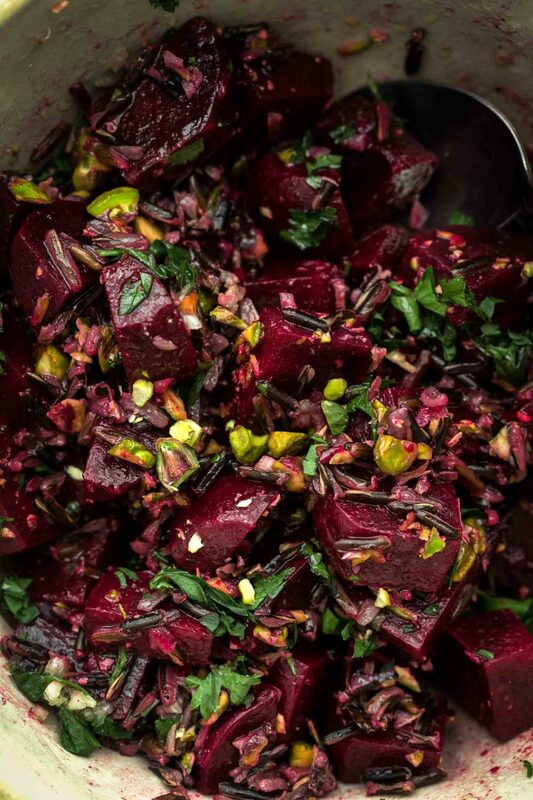 The beets and lemon are a wonderful combo, and the addition of toasted pistachios is genius. This was a hit at my house, and I got a request to make this again at Thanksgiving. I’m sure it will get made again on many other occasions, too. Thanks for the recipe! I’d give this 5 stars if I were rating it. This recipe sounds wonderful. I like the idea of adding some feta cheese for additional protein. I haven’t eaten either beets or wild rice in longer than I can remember. Oooh. I just bought beets! Definitely making this tonight! Your directions have everything combined when hot, but as a “salad” am I correct to assume it could be eaten at any temp? Making it for dinner tonight, but wanted to prep in advance… just wondering if I’ll need to reheat it? You are correct- could be at any temp. Two thumbs up! Thank you.